This outfit I wore is one that I wore on April 12th, the day Ohio decided to have actual Spring weather. The outfit consisted of a adidas Kansas Basketball workout shirt, some plain white Nike shorts, and some Nike socks and Nike slides. This was taken after I had just finished working out, so hence the slides for my feet to recover. I was able to wear this outfit during the day also before I worked out, since it was very warm outside. When I went to work out, I added a pair of Nike 3/4 grey/black tights for compression. While this outfit is one I definietly would wear in more casual settings, it makes my life easier that I don’t have to pick out another outfit to workout in when I can wear what I have worn the whole day to go straight to working out. But what shoes did you actually work out in? 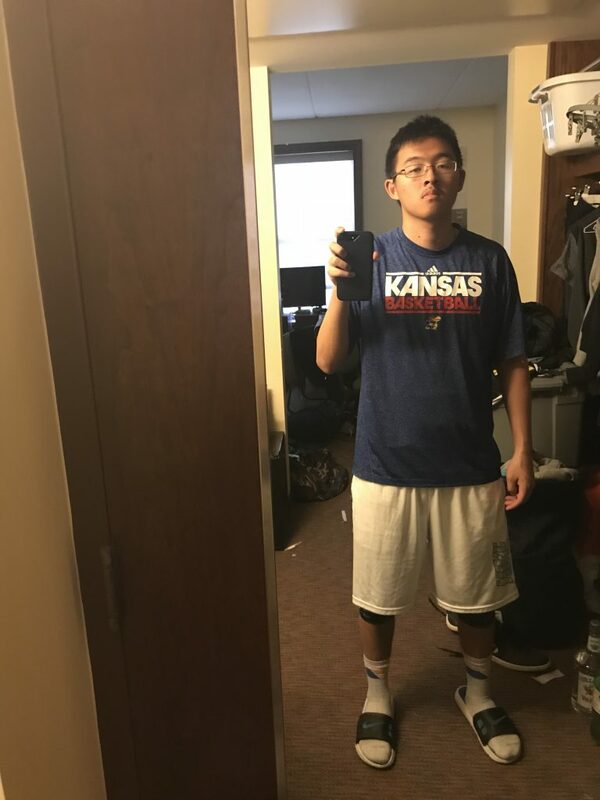 Did you wear a Kansas Basketball shirt because you’re a big fan or just because it was good for working out in?